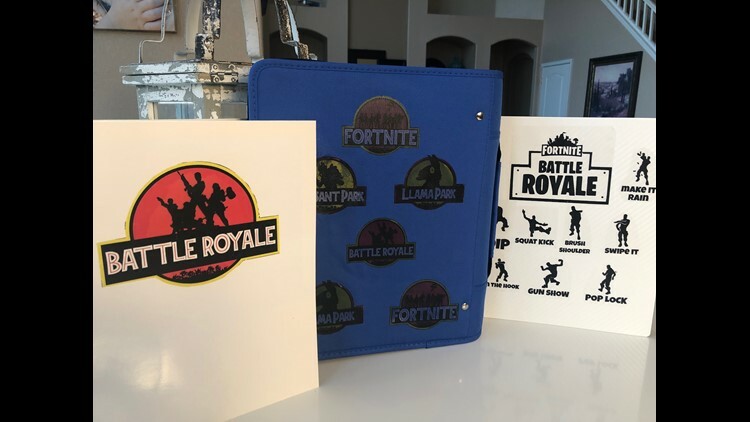 Here's how to make personalized back to school supplies. Order and purchase clipart online. Using a photo-editing software, create letter sized pages with the logos. For putting designs on backpacks and fabric binders you need to use the fabric transfer paper. Right before you print, you must reverse the page so it's backwards. For the fabric transfer, you must print out the sheets on an inkjet printer. Next, print out the labels, cut out the decals and used an iron to iron flamingos and pineapples on the backpack, cloth pencil holder, and a cloth binder. For putting designs on hard surfaces like notebooks, you can use sticker transfer paper. First, use the editing software to create your pages with logos and decals. Next, save it in a png format so it comes out with a clear background on the sticker paper. You do not want to reverse the page in the photo editing process for the sticker sheets. just save as you see it. Print out the labels on sticker paper. Cut the decals out, remove the backing and stick on your notebooks or binders. Find more DIY tips on my YouTube page or at CookCraftKids.com.